A worrying development on the London underground that I’ve recently learnt of: sitting down on the tube can cause temporary blindness. It is only upon taking your seat that this affliction hits, as beady eyesight is naturally necessary for outwitting fellow commuters and obtaining said seat. But once down, BAM! Up to 50%* of passengers may suddenly lose the ability to see past their Metro/ iPhone/ nose. Let me break here for a moment. I’m pregnant. Pretty early days – and I’d been feeling good, despite my hour-long commute surrounded by some of the earth’s most miserable humans, until now – but I’ve recently started fainting / feeling very woozy when standing for long periods. Fainting isn’t fun at the best of times, but when you’re trying to protect a bean-sized human in your tummy, it’s particularly scary. So sitting down on the train / tube is actually quite ideal. For one, sitting down nearly always stops you passing out. Secondly, you can’t collapse on top of several people/ hit your head / do serious damage. Asking for a seat is not something I find easy. Interaction with other humans in general is painful, but asking favours of strangers is basically something I’m allergic to (similarly to most Brits, I think). 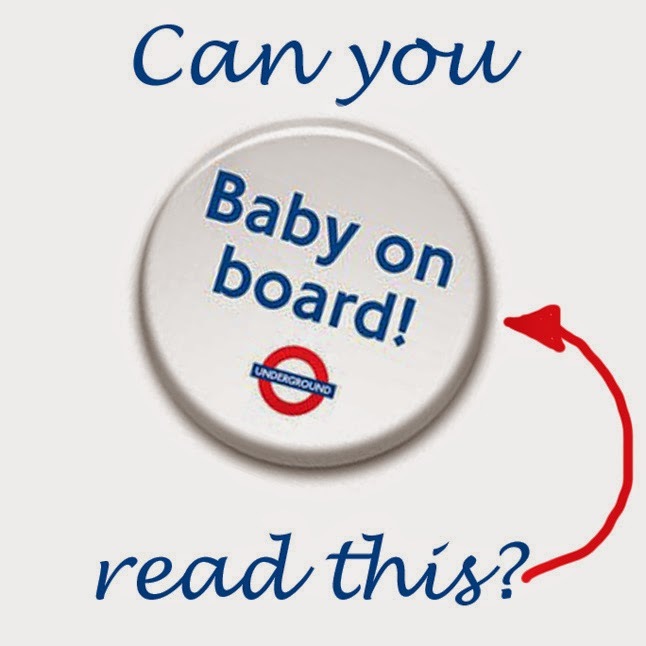 AND SO, enter the magical ‘Baby on board’ badge, from the lovely folk at the TFL. It’s basically a sign that says ‘I wouldn’t mind sitting down, if possible. And I’m not just being lazy’. Getting hold of the badge wasn’t easy. First Great Western, as part of a wider mission to make all its customers miserable, don’t do badges and require a doctor’s note to issue a pass, which you then have to flash at your fellow passengers like the seat police, while asking for their seat, which is what you wanted to avoid having to do in the first place. And the multiple underground stations I visited were out of the badges, and ‘didn’t know’ when they’d be getting more. But a friendly colleague had a badge not in use and so voila, onto my coat it went, and onto the tube I climbed, excited at the prospect of a journey without the stress of choosing between asking for a seat and coming to in someone’s lap, drenched in sweat with my handbag halfway down the carriage. But back to the problem at hand – the temporary blindness. My fellow passengers simply could not SEE the badge, pinned on my chest. I stood in that middle section between the two rows of seats, getting hotter and hotter and occasionally casting hopeful glances at the people sitting below me. Three women aged roughly 20-30, in the space of two stops looked up at me, glanced at the badge, and then looked back down at phones/papers/anywhere but at me. I get it – it’s nice sitting down. And I don’t look that pregnant. But TRUST ME, if I didn’t feel like I needed a seat, I wouldn’t be wearing the badge. After six stops, a business man at the other end of the carriage spotted me and offered me his seat, (thanks man,) which I gratefully accepted, as the temporarily-blind passengers watched, seemingly cured. It is a bit crap that women have to wear a badge rather than feel that they can ask for a seat (my fault) but it’s even CRAPPER (my blog, my word) that when they do wear that badge, and ask for help, that people just blatantly ignore it. It isn’t just badge wearers that people are blind to, either. Old folk, young children, those less able to stand and generally crackered people in need of seats are all too frequently left wobbling about while smug young folk enjoy a seat they don’t really need. Take a look around you commuters; there might be someone who could do with a sit down. And if doing a good deed isn’t motivation enough, think of the BRILLIANTLY AMAZING free karma you’ll get to cash in at a later date. UPDATE: I feel I should add that since writing the above, my fainty stage seems to have finished and I’ve stopped wearing the badge, as right now I don’t feel like I need a seat. But I’m now even more aware than ever of when people are sitting down in the place of someone who needs a seat more than them. I see someone everyday. Nearly all friends and colleagues I talk to are surprised by this, saying they always notice people getting up for people – but I’d urge you to look around for yourself; maybe I just get on the most miserable tube in London? Somehow I think not. Next Is it safe to use a bouncy castle while pregnant? And other things I’ve asked Google recently.